Savannah River Site features thousands of acres of forest as well as two large man-made ponds and a rather important creek. 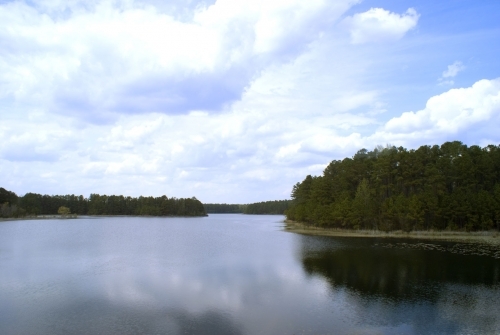 Pictured here is one of the lakes, named Par Pond. The other lake is in L Area and aptly named L Lake. Par Pond was originally named RAP Lake, an acronym representing the fact that it served R and P reactors. Because of the lake's proximity to the Masters Golf Tournament in Augusta, SRS reversed the order of the letters so they spell "Par." At 2,640 acres, it's a good bit larger than a mere "pond," but according to SRS, "Par Pond" sounds better than "Par Lake" from an alliterative standpoint. SRS is home to boars, bobcats, coyotes, white-tailed deer (South Carolina's State Animal), raccoons, opossums, wild turkeys (South Carolina's State Wild Game Bird), otters, yellow-bellied slider turtles and alligators, large-mouth bass, and even armadillos. The University of Georgia's Savannah River Ecology Laboratory operates a facility on Upper Three Runs Creek – home to 575 recorded species of aquatic insects. The only place on earth that outdoes this 20-mile blackwater stream in terms of aquatic insect biodiversity is Breitenback Creek in Germany, which boasts 635 recorded species. Upper Three Runs Creek also provides shelter for an array of other species, including as many as 700 worms, crayfish, other large crustaceans, and mussels. On the flip side, Upper Three Runs Creek may benefit from the site's relative isolation from common pollutants such as lawn fertilizer and parking lot runoff. Additionally, the USDA Forest Service, which manages the wooded areas at SRS, takes care not to harvest trees from adjacent land. The Forest Service does harvest trees from other areas of SRS. Over the years, it has planted millions of seedlings which are systematically harvested and replanted. The Forest Service manages all of SRS's natural resources, working with numerous corporations and colleges in this pursuit. The site also serves as a National Environmental Research Park. Both Par Pond and L Lake are fished on a regular basis. Due to the site's warmer waters, the average catch is 5 pounds, and one out of five casts will typically result in a catch. Fishing without permission is illegal of course, but some have not been deterred. One Barnwell man has been caught 27 times!